The best things I’ve done this year. Probably the biggest lifestyle change I’ve made this year has been to go vegan, and it’s been such a positive, joyful change in my life. I feel as though it’s led me to engage with food in a completely different way- not only am I a better cook now as I’ve learnt to be far more adventurous and creative in the kitchen, I’m so much more switched on to nutrition too. And not just mine, but since Ottie eats a vegan diet also and Jason too eats vegan for all our shared meals, the nutrition of our entire family! 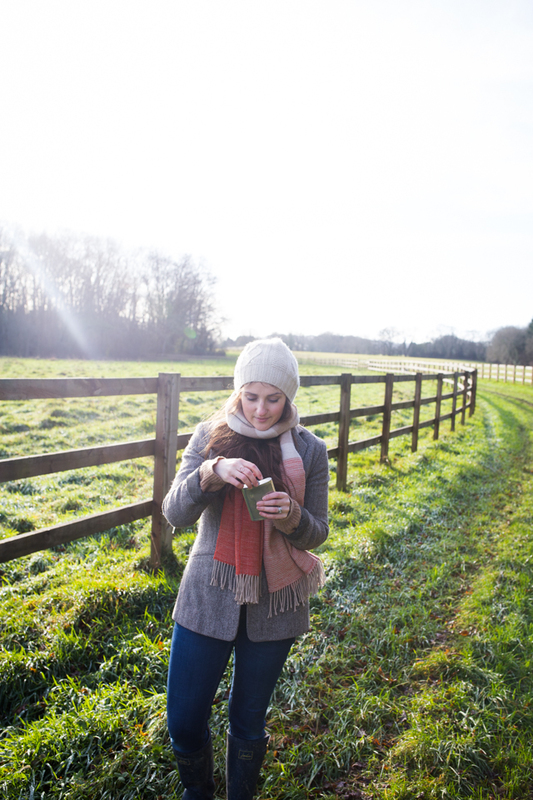 As well as seeing benefits to my health and wellbeing, it’s led me to become more conscious of my impact on the planet and take steps to live in a more environmentally friendly way. I feel like I could write a whole post, (or even a whole series of posts!) all about this, so please do shout if you’d like to see more! I’ve always adored the idea of growing my own vegetables and fruit, but never really imagined it was something I could do. I remember telling Jason back in February of 2017 that I’d bought some courgette seeds, and he was sceptical that my interest in the whole project would last longer than it took me to plant the seeds and then promptly kill them off!! ;) But lo and behold, by midsummer I not only had a supply of courgettes coming from my little garden that was so plentiful I was handing them out to everyone in our street (Crazy Courgette Lady, that’s me…) but I also was growing runner beans, cucumbers, lettuces, carrots, cucumbers, potatoes and so much more. It’s become such a passion that Jason’s even picked up the bug too now, and we’re in the process of building several huge raised beds for all my fruit and veg and had a lorryload of compost delivered just a couple of days before Christmas! I honestly can’t even tell you how excited I am for the growing season to begin this coming February so that I can get gardening again. This year I not only got back into a routine of weekly Body Balance classes (I’ve been banging on about how much I adore Body Balance for years now, it really is my favourite! ), but I also discovered Body Pump! I was so nervous before my first class since I’d never really worked out with weights before, and though it’s tough, it’s also the biggest endorphin rush and such a great workout! I’m looking to find decent classes round where we live now, so that I can get back into the swing of regular classes. My biceps have never looked better than with a weekly hit of Body Pump! 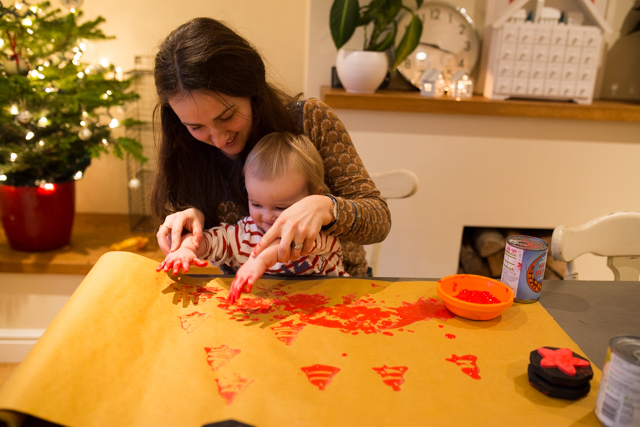 This kind of seems like a silly one, but this year I’ve learnt a couple of tricks that’ve honestly changed my life when it comes to keeping on top of all the household life admin that can become such a chore. Firstly, meal planning! I used to write out our week’s meal plan on a random note on my phone or in a notebook, and then never really look at it again once we were done with that week. Now, I keep a running note on my phone in Evernote (my favourite app!!) with each meal plan listed in there as I write them, so that I can look back at what we’ve eaten in previous weeks when I get stuck for inspiration. It’s honestly been a total time saver! The second trick is to keep a couple of microfibre cloth (and a can of polish, if you fancy) stashed in different rooms of your house, so that you can have a quick whip round every couple of days rather than feel as though the cleaning jobs are piling up and the house is getting on top of you. Such a boring life lesson to learn, but it’s totally changed my game when it comes to keeping the house feeling clean and not getting bogged down by the never ending chores! This year I made it my mission to not only print out all my favourite photos, but to put them all into proper albums with a date and a little note written for each picture too. And I did it! I use the Truprint app because it makes it so crazy easy ordering straight off your iPhone (not an ad, just a recommendation!) and just bought a couple of big cheapo albums from Boots to put all the prints in. It’s so lovely to flip through tangible photographs, and hope that the little notes and dates next to each print will make it more fun for Ottilie to look back through the albums in years to come. So we’ve officially been in our new home for two and a half weeks now, and we’re so so happy here! I’ve been sharing lots of updates on Instagram, but now that we’ve finally been blessed by the Internet Gods and have fibre internet (Praise be!! It was like living in the dark ages until a couple of days ago…), I thought it was high time I actually did a bit of blogging! 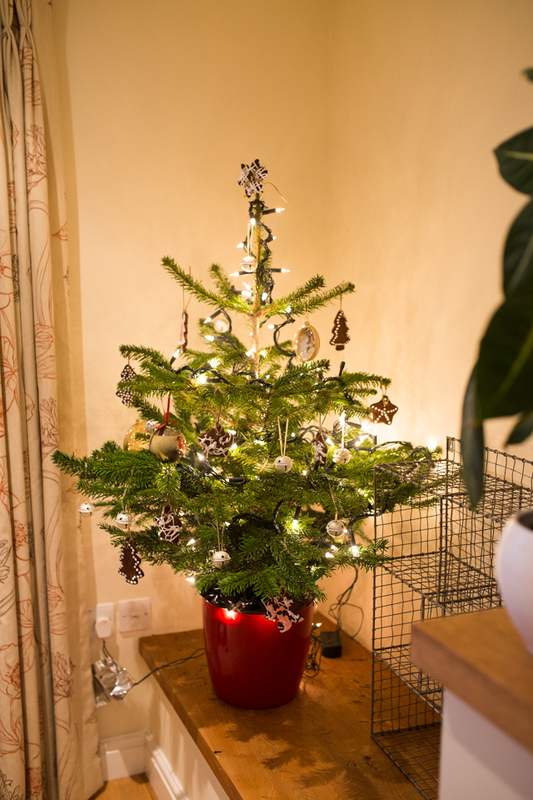 Now that the bulk of the unpacking is done, and we’re down to just the odd box here and there that I just can’t quite be bothered to tackle, I’ve been able to turn my attention to all things Christmas! I’ll be honest and say that I’ve cheated at my Christmas shopping this year and done literally all of it online. Though is that cheating? Or just really sensible, when you’ve got a toddler with limited patience for being strapped into a pushchair and wheeled round the shops, and it costs about as much to park in Guildford as it does to have stuff sent out? And in any case, online shopping is my jam. No crowds, hassle free, and you can do it whilst soaking in a hot bath. Winner. 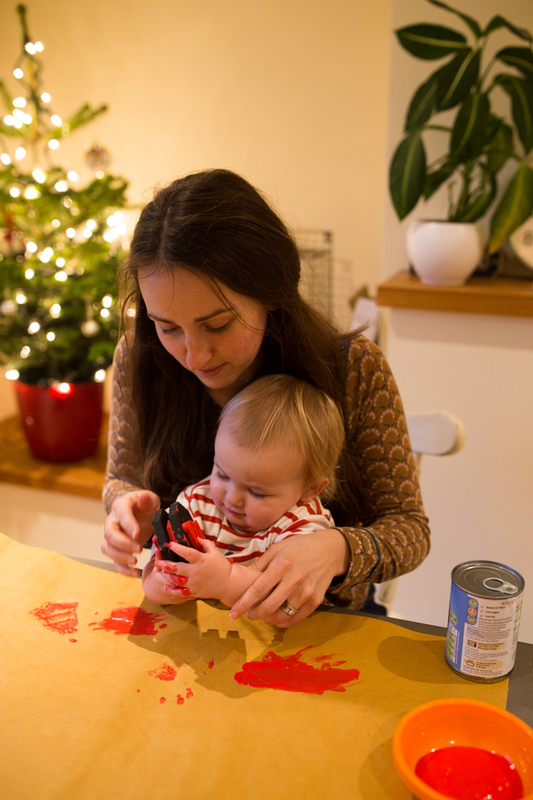 I’ve had visions in my head, and a ‘to do’ list running on my phone, of what crafts and activities I can do with Ottilie this Christmas for a good few weeks now. Now, baking is one thing but I’m really not a naturally ‘crafty’ person. My artistic ability is limited to being able to take a half decent photo, and that’s about it. 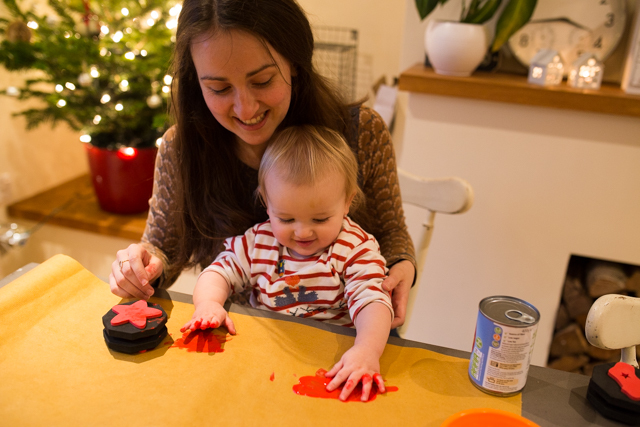 But I honestly can’t wait to get involved with all manner of crafts as Ottie grows- painting, collaging, potato stamping- I’m ready! 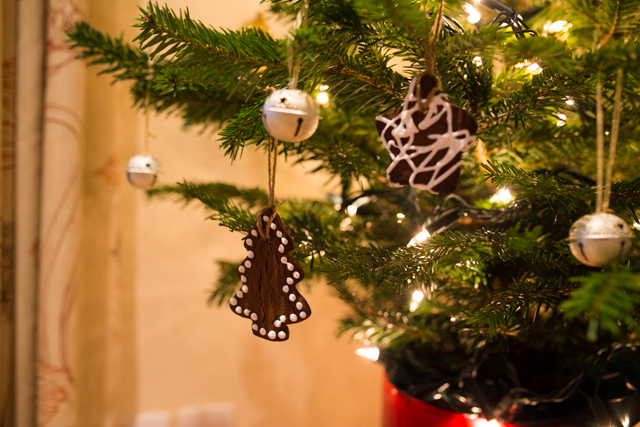 We’ve managed two little crafty activities this week, one with great success (hello home baked gingerbread decorations hanging on our kitchen tree!) and one…less successful! 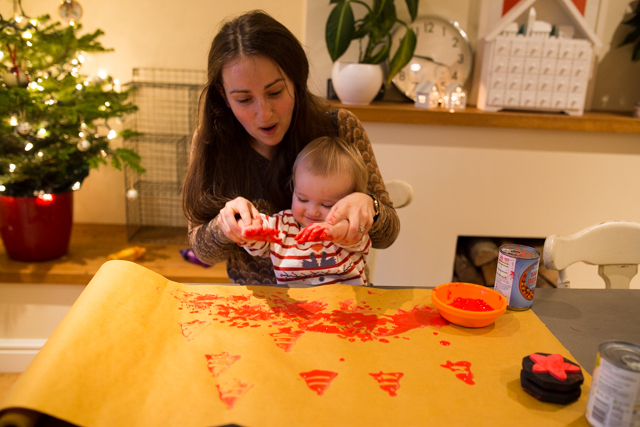 I thought it would be fun to order some Christmas foam stamps and print our own wrapping paper…but it turns out I massively overestimated my 15 month old’s ability to carefully dip a stamp into paint and press it onto the paper! 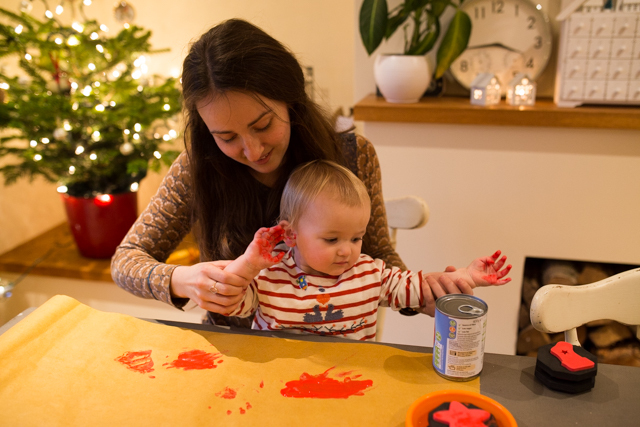 What she of course was really into was dunking her entire hand into the paint, and the smearing paint on herself, me, the cans of beans I was using to weigh down the paper, the table, and then splatting so much paint onto one single patch of paper that it turned into a sodden mess. And she had a great time doing it!! Until she decided to see what poster paint tastes like and then that particular activity came to an abrupt end. She does ask to eat them from the tree approximately eight million times a day, so I made some extra plain ones too that she’s allowed have one of as a post-dinner treat. 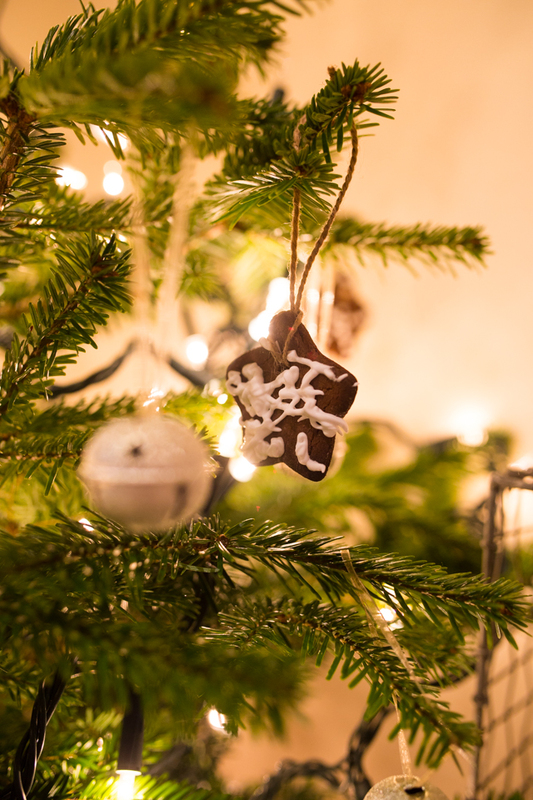 Though we did lose one of the tree decorations to that naughty white and brown dog of ours who decided to help herself one evening!